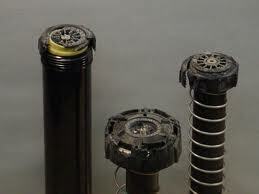 Most broken sprinkler heads involve a simple fix that any home owner can do. The temptation might be to call a service that specializes in sprinkler head replacement, but this could cost upwards of $50.00 for a simple repair that anyone can do on their own. If your pop-up sprinkler has been broken because of a mower, edger, or string trimmer hitting it, the cost will usually be less than $5.00 and only take a few short minutes to replace. The video below will show you just how simple it is to replace a pop-up sprinkler on your own. Whether the top needs to be replaced because it has been damaged by a string trimmer or edger, or if the riser underneath the sprinkler has been broken because of a mower wheel knocking it over, the video will show you what to do. All the items you need can be purchased at your local Home Depot, hardware store, or irrigation supplier.